The entrance to the Fortes Motor Lodge. 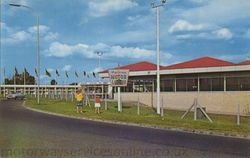 Peartree can trace its history back to the Fortes Motor Lodge Oxford, the upmarket name Fortes gave to the grand service station when it opened on 29 June 1964. It remained with them until it was transferred to Granada in 1996. When it opened it had an Autogrill restaurant with a charcoal grill and a 24-hour snack bar. The walls down to the basement toilets were lined with carpet. 350 parking spaces were included. The building, which was built in the same style as the Autogrill at Barnsdale Bar, was positioned to be visible from the old A34. Although at the time there were no motorways near here, this was still the junction of several major roads, and Fortes wanted to introduce their facilities without the hassle and regulations encountered when running a motorway service area. The motel itself was called Excelsior Motor Lodge. 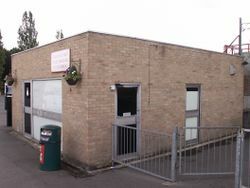 It had a swimming pool and a covered, drive-through reception area on the sliproad. Several changes were made to the services, introducing a carvery, and then the country's first Granary restaurant. The hotel became the Oxford Lodge, and the services were known as Oxford. In 1981, a Little ChefHistory was built outside the services, the first Little Chef at a service area like this. In 1986, Fortes applied their newly-acquired Welcome Break branding to the site. The hotel was then renamed Welcome Lodge. When Granada purchased Fortes, they were soon forced to sell all of Welcome Break's motorway services - but Peartree was left out of that because it wasn't on a motorway. The Welcome Break branding had to be removed. Granada moved the Little Chef in to the main building, with a coffee shop, a Granada Shop, game arcade, and a Burger King. The hotel became the Oxford Lodge. With the opening of the Peartree park and ride site down the road, and the upgraded roundabout being named 'Peartree Roundabout', the services became known as Oxford Peartree. Under Compass the hotel, which was now looking very elderly, was demolished and replaced by two hotels. The larger, more upmarket hotel was promoted as the first Posthouse to be built in 20 years. However, by the time they opened, Compass had sold its hotel business, so these became a Holiday Inn and a Travelodge, operated by their respective owners. The restaurant was the first to become a Little Chef Choices, where it gained an Upper Crust counter and a joint Little Chef/Harry Ramsden's/Caffe Ritazza menu. This was removed, but the game arcade became a Coffee Tempo!. As Little Chef encountered financial difficulties, they struggled to maintain such a large site. Inside and out there was evidence of poor upkeep all around. Even so, Little Chef said they liked the site, and claim they were disappointed when their lease expired and they were denied the opportunity to renew it. Welcome Break took over the site in April 2010 and completely stripped it out, with the new facilities opening on 9 July 2010. This means it has now been owned by Welcome Break on two separate occasions. Their takeover extends to the main facilities only, meaning they do not operate the hotels.